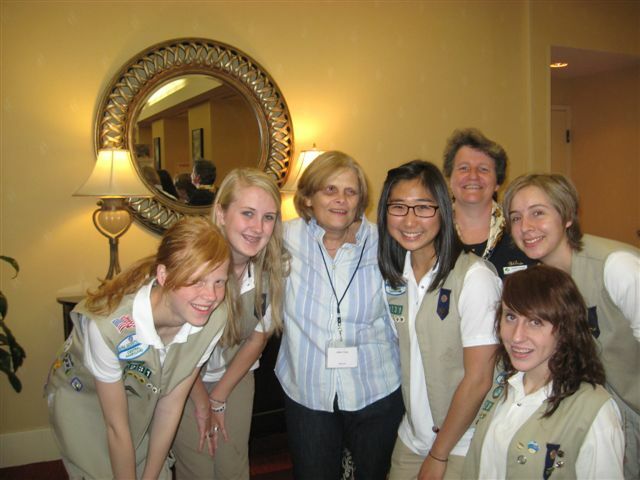 Members of Troop 1231 with a 1955 Girl Scout alumna. although we were not sure exactly what to expect, we ended the day with lots of stories about the fun that we had and all that they had learned about the seeing impaired. We even met an attendee who was a Girl Scout in 1955 and she enjoyed telling us all about her experiences of when she was a scout – most specifically that Girl Scout Cookies only cost $.50/box when she was a scout in Indiana! 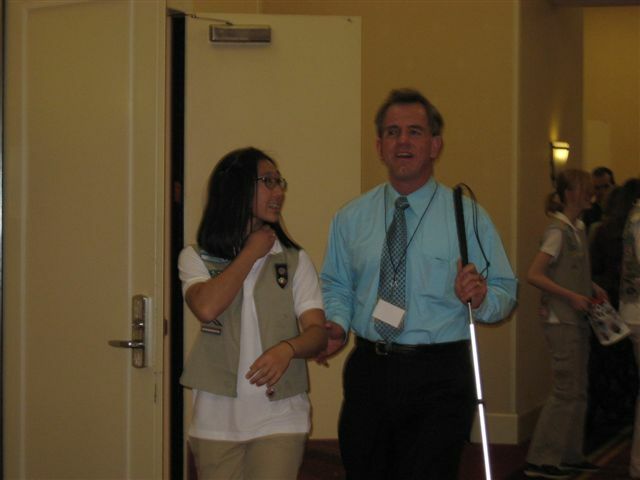 A member of Troop 1231 assists a convention attendee. We learned that there are different levels of impairment and that not all individuals want or need help, as well as the do’s and don’ts of how to guide someone who needs help, and were able to meet a bunch of guide dogs. We also learned how and when you should approach a guide dog and if you even can or should. During the event, we helped the attendees get to different locations throughout the hotel so that they could attend the many sessions that were being offered. 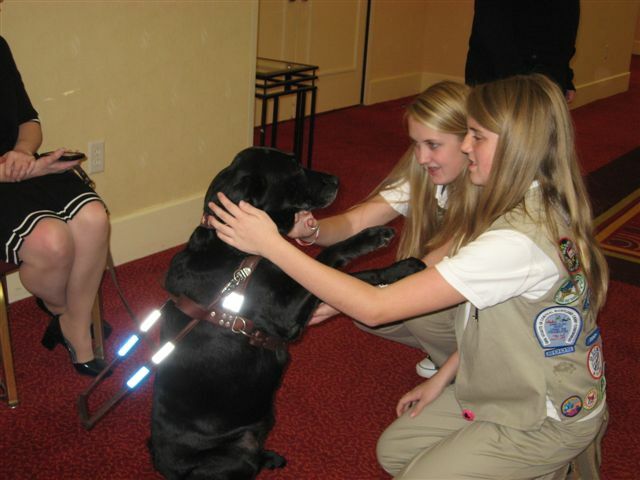 Girls from Troop 1231 with a guide dog. We helped distribute lunches and refreshments to the attendees. Some of us even assisted the speakers in their presentations, specifically at the GPS Adventure session, where the attendees used portable GPS units and went outside to take a walk to various locations along the roadway. It was a very rewarding, learning experience for all of us and our leaders and we all are looking forward to helping out the ACB again next year. Thank you to Troop 1231 and leader, Barb Stoddard, for all your hard work! Have a Girl Scout experience you’d like to share with us? Contact us at communications@gscm.org.